ICT has become part of the way in which we all work and entertain ourselves. Almost everything we do at school now involves the use of ICT. Thus, through teaching ICT, we equip pupils to participate in a world of rapidly changing technology. We enable them to find, explore, analyse, exchange and present information. We also help them to develop the necessary skills for using information in a discriminating and effective way. This is a major part of enabling pupils to be confident, creative and independent learners. 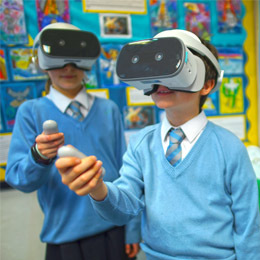 All pupils at FCJ have the opportunity to work with computers and other technological equipment such as iPads, 3D printers, interactive whiteboards, VR Headsets* and digital cameras from the Reception Classes through to end of Year 6. The software used is age appropriate and programmes are used to enhance learning in all areas of the curriculum. Each classroom has 2 PCs and there is a air conditioned and ventilated ICT Suite with 28 PCs for student use. 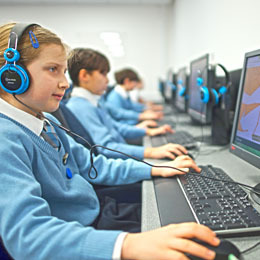 ICT is not taught in isolation; it supports and enhances all curriculum areas of learning. Every teaching base is fitted with an interactive whiteboard. These were funded by our active and supportive Parent Staff Association (PSA).